Flavors from our home to yours! 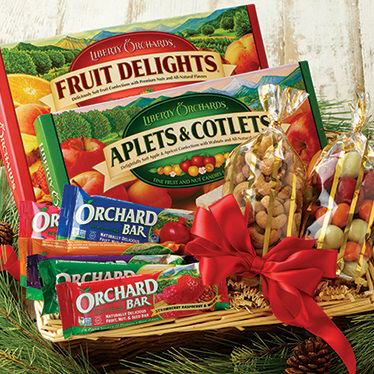 Our popular gift basket arrives filled with a delicious taste of the Pacific Northwest...from the berry farms of Oregon to the apple orchards of Washington State! Includes one 14-oz. 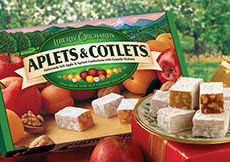 box each of our original Aplets & Cotlets and orchard-fresh Fruit Delights, a 9-oz. bag of Berry Bites in four flavors, a 7-oz. 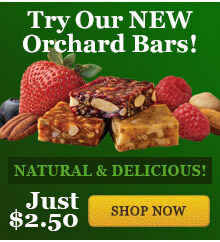 bag of Deluxe Mixed Nuts, and seven flavors of our delicious fruit-and-nut-filled Orchard Bars. It's the perfect way to send a little Pacific Northwest flavor to friends and family...or enjoy all by yourself! Gift wrap not available for this item. INGREDIENTS: Strawberry-Raspberry Orchard Bar: fruit [fruit juice from concentrate (organic apple, strawberry), strawberries, raspberries, organic apple flake], organic evaporated cane syrup, organic tapioca syrup, nutmeats (walnuts, almonds), seeds (sunflower, flax), soy protein nuggets (soy protein isolate, tapioca starch, salt), fruit pectin, citric acid, natural flavors, sodium citrate, ascorbic acid, Vitamin E (to preserve freshness). INGREDIENTS: Blueberry-Pomegranate Orchard Bar: fruit [fruit juice from concentrate (organic apple, blueberry, pomegranate), blueberries, pomegranate powder, organic apple flake], organic evaporated cane syrup, organic tapioca syrup, almonds seeds (sunflower, flax), soy protein nuggets (soy protein isolate, tapioca starch, salt), fruit pectin, citric acid, natural flavors, sodium citrate, ascorbic acid, Vitamin E (to preserve freshness). INGREDIENTS: Pineapple-Coconut Orchard Bar: fruit [fruit juice from concentrate (organic apple, pineapple), pineapple, coconut, organic apple flake], organic evaporated cane syrup, organic tapioca syrup, nutmeats (macadamias, cashews, Brazil nuts) seeds (sunflower, flax), soy protein nuggets (soy protein isolate, tapioca starch, salt), fruit pectin, citric acid, natural flavors, sodium citrate, ascorbic acid, Vitamin E (to preserve freshness). INGREDIENTS: Banana-Mango Orchard Bar: fruit [fruit juice from concentrate (organic apple), mango, banana, organic apple flake], organic evaporated cane syrup, organic tapioca syrup, nutmeats (macadamias, cashews, Brazil nuts) seeds (sunflower, flax), soy protein nuggets (soy protein isolate, tapioca starch, salt), fruit pectin, citric acid, natural flavors, sodium citrate, ascorbic acid, Vitamin E (to preserve freshness). INGREDIENTS: Cherry-Almond Orchard Bar: fruit [fruit juice from concentrate (organic apple, cherry), cherries, organic apple flake], organic evaporated cane syrup, organic tapioca syrup, almonds seeds (sunflower, flax), soy protein nuggets (soy protein isolate, tapioca starch, salt), fruit pectin, citric acid, natural flavors, sodium citrate, ascorbic acid, Vitamin E (to preserve freshness). INGREDIENTS: Cranberry-Orange and Walnut Orchard Bar fruit [fruit juice from concentrate (organic apple, cranberry), cranberries, orange peel, organic apple flake], organic evaporated cane syrup, organic tapioca syrup, walnuts seeds (sunflower, flax), soy protein nuggets (soy protein isolate, tapioca starch, salt), citric acid, fruit pectin, sodium citrate, natural flavors, ascorbic acid, Vitamin E (to preserve freshness), soy lecithin. INGREDIENTS: Pear Almond Orchard Bar fruit [fruit juice from concentrate (organic apple), pear and apple flake], organic evaporated cane syrup, organic tapioca syrup, almonds seeds (sunflower, flax), soy protein nuggets (soy protein isolate, tapioca starch, salt), fruit pectin, citric acid, sodium citrate, natural flavors, salt, Vitamin E (to preserve freshness), ascorbic acid. 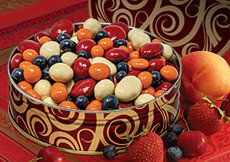 INGREDIENTS: Berry Bites: White chocolate [sugar, whole milk powder, cocoa butter, soy lecithin (an emulsifier), vanilla], dark chocolate [sugar, chocolate liquor, cocoa butter, milk fat, soy lecithin (an emulsifier), vanilla], cherries*, strawberries [strawberries, sugar, citric acid, sulfur dioxide (a preservative), red 40, strawberry flavor], apricots [apricots, rice flour, sulfur dioxide (a preservative]), blueberries [blueberries, high fructose corn syrup, glycerol, safflower oil, citric acid, calcium lactate, potassium sorbate, natural blueberry flavoring], confectioner's glaze, red 40 lake, gum arabic, blue 2 lake, yellow 6 lake, natural and artificial flavors, citric acid. *cherries are machine-pitted and may contain pits or pit pieces. 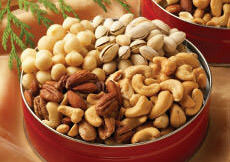 ALLERGEN INFORMATION: This product manufactured on equipment that also processes peanuts, tree nuts and wheat. INGREDIENTS: Deluxe Mixed Nuts: cashews, almonds, pecans, hazelnuts, macadamias, peanuts, Brazil nuts, partially hydrogenated soybean oil, salt.